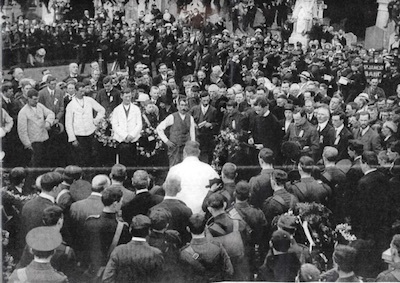 A number of events are planned to mark the centenary of the funeral of Irish patriot Jeremiah O’Donovan Rossa of the Irish Republican Brotherhood. Sinn Féin are carrying out a re-enactment of the funeral as their first event of their 2016 Centenary programme in Dublin. 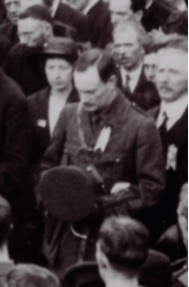 The following is an account of his life, and the full text of the famous oration delivered by Patrick Pearse at his graveside, one hundred years ago this week. Jeremiah O’Donovan Rossa (1831 – 1915) was born to Irish tenant farmers on September 11, 1831 in Rosscarbery, County Cork, Ireland. Described as the last great peasantry of Europe, even the poorest denizens of London were better off than the typical Irish farmer. When he was twelve years old, the Act of Union was enacted in January 1801 which abolished the Kingdom of Ireland with its independent parliament and created the United Kingdom of Great Britain and Ireland that linked the fortunes of Ireland to England. Ireland at that time was a land where absentee landlords controlled 90% of the arable land, and the majority of crops and livestock produced by the tenant farmers was being collected and sent across the channel in lieu of rent. The natives were forced to subsist on little more than the lowly potato, which provided the nutrients necessary to support life and had the highest yield per acre. According to the 1841 census, land in Ireland was divided into holdings among 825,000 people. By 1845 two and a half million acres had been planted in Ireland with lumpers, the poorest variety, and planted over and over until it was all the easier for a disease to infect and destroy them. When the potato crop failed that year, a good portion of the harvest was lost. It failed again in 1846, and the crop failed totally in 1847. This year, known forever after as “Black ‘47”, was by far the worst, and spelled certain death for those whose existence was linked to the tuber. At harvest time, the potatoes were black when pulled out of the ground and turned into mush when cooked. Literally millions of Irish men and women were faced with an inability to pay their rent and subsequently, were cast out of their rude dwellings. Help from across the channel was not forthcoming and when it eventually came, it was inadequate. The nation was suddenly deprived of its primary food source and its only means of paying “the rint”. Thousands were evicted and crowded the workhouses while thousands more wandered the roads aimlessly in search of food. More than a million people chose to emigrate, while more than a million others stayed and died. For those who remained and survived, the abject poverty and hopelessness of their lives contrasted sharply with those of their brethren abroad. “I did not know how my father felt, I did not know how my mother felt; I did not know how I felt myself. There were four of us children. The potato crop had gone. The wheat crop had gone”. In order to feed his family, Rossa’s father took a job building roads and he caught famine fever and died in March 1847. To the end of his life Rossa refused to acknowledge that the famine was an act of God, considering it a blasphemy and an injustice to blame God. English landlords were to blame, he held, and that they were worse than the malign demons of Hell. It was this undying hatred and uncompromising focus on Irish freedom that would have impact long after he was gone. In 1856, he founded the Phoenix National and Literary Society ‘for the liberation of Ireland by force of arms’. Rossa was still in Cork when James Stephens, Thomas Clarke Luby, James Denieefe, Garret O Shaughnessy and Peter Langan founded the Irish Republican Brotherhood in Dublin on St. Patrick’s Day, 1858. Stephens himself came to Rosscarbery in 1858 and Rossa was one of his first recruits. In December 1858 Rossa was arrested and jailed without trial until July 1859. Rossa was accused of plotting a Fenian rising in 1865, tried for high treason and sentenced to penal servitude for life due to his previous convictions. He was imprisoned in Pentonville, Portland and Chatham Prisons in England where, for eight years, he suffered inhumane and cruel treatment at the hands of the prison authorities. He was fed on bread and water for 28 days at a time. In Chatham, his hands were cuffed behind him every morning at 6:45am and to be able to eat his food he had to get down on all fours like a dog. This went on for more than thirty days. In 1869 he was elected to Parliament for Tipperary but his election was declared void because he was imprisoned. In Ireland, Rossa served part of his sentence but was released in the general amnesty of fenians in 1870 with the understanding that he did not return. Given a choice, he weighed going to Australia, but settled on America. O’Donovan Rossa arrived in New York City in January 1871 aboard the steamer SS Cuba with other released Fenian prisoners Charles Underwood O’Connell, John Devoy, Henry Mulleda and John McClure. Of the five, only Rossa and Devoy remained active, both joining the fledgling Clan na Gael, founded by New York Herald scientific reporter Jerome J. Collins in June, 1867 as a response to the feuding within the Fenian Brotherhood. Upon his arrival, Rossa joined the Fenian Brotherhood and edited the American edition of the United Irishman, and ran unsuccessfully for political office against Tammany Hall’s William Marcy “Boss” Tweed in 1871. In 1872 he leased The Northern Hotel near Chatham Square in Manhattan’s notorious Five Points district. On September 4, 1875 an anonymous letter appeared in Patrick Ford’s Irish World, the premier Irish American newspaper of the day. The letter called for militant action, which “does more to keep the faith alive than a thousand sensible, prudent, wiseheaded patriots who crawl on crutches...into forgotten graves.” The idea was not lost on Rossa. He responded with a letter on December 5th and established what he called a ‘skirmishing fund’ to begin soliciting donations to send the war back to England. He proposed the use of the newly invented dynamite as the instrument of retribution. Although the like-minded Ford had editorialised that there were enough Irishmen living in England to “give London to flames and reduce Liverpool to disaster...spread through all the emporia of England, terror, conflagration, and irretrievable destruction”, he held the letter for three months before publishing it in March, 1876. The fund was wildly successful, collecting $23,000 by March 1877 from 30,000 contributors in the United States, Canada, Ireland, England and Scotland. Rossa had accurately gauged the temperment of the Irish Diaspora. Rossa began writing a column in the Irish World and in it, he chastised his old friend Devoy and Clan na Gael for embracing a policy of co-operation with the constitutional movement. Rossa’s threats of bombings horrified Clan na Gael. Secretly, they planned the very same thing and Rossa’s bombast was calling undue attention to them. When the fund reached $43,000 later in 1877, Clan na Gael seized control, but left Rossa as secretary. By the following March, the Northern Hotel had failed but Rossa continued his anti-English vitriol. When he was seen going from one tavern to another on Park Row near the Herald offices, Devoy seized the opportunity and had him expelled from Clan na Gael, supposedly for his drinking, but more so because of his influence among Irish and Irish-Americans and his insistence on keeping the Fenian Brotherhood alive contrary to the wishes of the clan. Devoy had him put in a convent in Summit, NJ for rehabilitation. The Fenian Brotherhood, hopelessly divided and powerless, elected Rossa the last “Head Centre” in 1877, but by 1880 they had begun to disappear, and the group no longer had the financial support or membership it had once enjoyed. Rossa’s blustering was nothing more than that until January, 1881 when a bomb exploded outside a military base in Salford, near Manchester killing a 7 year old boy. In June 1881 two of Rossa’s men were arrested in Liverpool with a cast iron pipe filled with explosives smuggled from America. Two weeks later, six dynamite bombs, dubbed ‘infernal machines’ by the press were discovered aboard the SS Malta, docked in Liverpool after arriving from America. The bombing campaign was underway and Rossa had drawn blood. Rossa, by now a celebrity of international proportions, was questioned by reporters about the bombings and he admitted to supplying the money. The British government began calling for his extradition. They found it appalling that a civilised country such as the United States would allow such activities against another, and now it has led to bloodshed. Rossa himself found this strangely ironic as England had paid his passage to America in 1871 with the condition being he could not return to England, Scotland or Ireland for twenty years. Now they wanted him back. When the reigns of Clan na Gael power passed from John Devoy in New York to Alexander Sullivan of Chicago, the Skirmishing Fund came under the control of The Triangle, an inner circle consisting of three members of Clan na Gael who re-instituted Rossa’s original scheme and began in earnest the “Dynamite War” against England. The Rossa aspect and the Clan na Gael portion of the entire affair is lumped together, but the devices used by Rossa’s men were crude and caused little damage. The explosives used by the clan bombers were far more deadly and created far more havoc, but it was Rossa’s mastery of propaganda, more so than his actions that put fear in English hearts. Due to his campaign, nearly every branch of the nationalist movement shunned him, and it also nearly cost him his life. “ENGLAND’S BULLET -- A HIRED BRITISH ASSASSIN ATTEMPTS TO MURDER O’DONOVAN ROSSA -- ENGLAND WILD WITH REJOICING”, declared the Irish World headline in February 1885. An Englishwoman named Yseult Dudley met Rossa near Broadway on the pretext of making a contribution to his skirmishing fund and shot him several times. The incident caused a sensation in New York as Rossa and even some of his detractors declared Dudley to be an agent of the English government. England claimed that she was a mentally unstable woman acting on her own delusions. Rossa never believed it. Rossa settled on Staten Island and would tell of his experiences in his 1874 book Prison Life (re-released as Irish Rebels in English Prisons in 1882) and Rossa’s Recollections 1838-1898. For the remainder of his life he remained the most visible Irish exile in America and an outspoken critic of the British occupation of Ireland. He appeared at speaking engagements all over the country relating his prison experiences, performing readings of his books and giving accounts of his involvement in the Fenian Brotherhood and his fight against the British. No longer a political pariah, he visited Ireland in 1894 and was given a patriot’s welcome. He visited again in 1904 when he was made a freeman of Cork City. In Dublin, a memorial to Rossa stands on Grafton Street corner and Richmond Bridge was renamed O’Donovan Rossa Bridge in his honour. Skibbereen is home to the O’Donovan Rossa memorial park. On his deathbed at age 83 years, he sent “Rocky Mountain” O’Brien to get old friends John Devoy and Ricard O’Sullivan Burke and bring them to his bedside. He died a tired old warrior on June 29,1915 in St. Vincent’s Hospital on Staten Island after a two year illness. Devoy, aware that when Young Irelander Terrence Bellew McManus had died in San Francisco in 1866 the funeral procession became a massive propaganda coup, he contacted Tom Clarke in Ireland, himself a Clan na Gael member, and Rossa’s remains were sent home. The following is the full text of that oration, with translations. This is a place of peace, sacred to the dead, where men should speak with all charity and with all restraint; but I hold it a Christian thing, as O’Donovan Rossa held it, to hate evil, to hate untruth, to hate oppression, and, hating them, to strive to overthrow them. Our foes are strong and wise and wary; but, strong and wise and wary as they are, they cannot undo the miracles of God who ripens in the hearts of young men the seeds sown by the young men of a former generation. And the seeds sown by the young men of ‘65 and ‘67 are coming to their miraculous ripening to-day. Rulers and Defenders of Realms had need to be wary if they would guard against such processes. Life springs from death; and from the graves of patriot men and women spring living nations. The Defenders of this Realm have worked well in secret and in the open. They think that they have pacified Ireland. They think that they have purchased half of us and intimidated the other half. They think that they have foreseen everything, think that they have provided against everything; but the fools, the fools, the fools! — they have left us our Fenian dead, and while Ireland holds these graves, Ireland unfree shall never be at peace.